There have been quite a few news stories coming out of Florida regarding increased incidences of human-black bear conflicts. Thanks to Dr. Jonkel’s brother who resides in the state, we recently learned of yet another: two Florida black bears, a mother and her cub, were stalked and shot by an 82-year old man. The man claimed he was protecting his dog and neighbors in shooting the bears, yet, it was found that neither the neighbors, nor his dog (or himself) were in danger from the bears, according to officials. It is illegal to shoot or kill a Florida black bear, which is a subspecies of the American black bear, and the man was charged with a fine of $750 for causing the deaths of the two bears. The rising incidences of human-black bear conflict in Florida are likely a result of increases in both black bear and human populations, leading to increasing development in black bear habitat. Such expansion has pushed bears into residential areas where they are getting into trouble, learning to eat trash and other sources of unnatural bear food such as pet food, bird feeders, gardens, and compost piles. 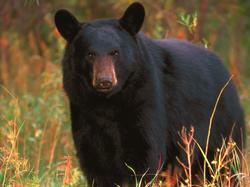 This news story is yet another example of the importance of being Bear Aware in bear country. Whether you’re in Montana or Florida, keeping food and trash out of reach from bears is paramount to keeping both bears and humans safe!